We offer lines of pickups and amps specifically designed for use with acoustic instruments. Within those lines there are a lot of options. When you have us install a pickup system we’ll help you sort through the most appropriate choices for your needs. We carry the full line of Fishman pickups for acoustic instruments, including the Rare Earth Pickup series. Fishman offers a wide variety of pickups for all sorts of settings and instruments. Their products are reliable and well-researched. To compliment the pickup in your instrument, Fishman offers their Loudbox acoustic instrument amps. The Loudbox Artist (120 watts) is a mainstay. 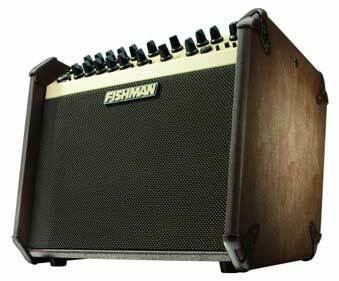 Their smaller offering, the Fishman Loudbox Mini, provides power and clean tone in a smaller, lighter package. It’s a 60 watt, 2-channel amp that includes digital reverb and chorus and weighs just under 20 lbs. 120 watts, 2 channels, accepts 1/4″ or XLR sources, 3 band EQ and feedback controls, effects (reverb, chorus, flanger, delay, echo, slap echo) 25.5 pounds. Our Most Popular Model, 60 watts, 2 channels, 20 pounds. Contact us regarding other pickup installations. Used Amps, when we have them, are listed on a section of our Used and Vintage Amps page.